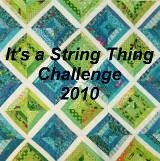 It's a String ThingChallenge: Novelty String Quilt ... Finished! Novelty String Quilt ... Finished! Wow, this is a really scrappy, busy quilt! I did an all-over loopy meander design. I tried to keep it simple since there is so much going on with the top. I was going to use a 101 Dalmatians bed sheet for the backing, but instead I used a really cute Raggedy Ann-Andy print that I found in my stash. It has a medical theme and the characters are dressed as doctors and nurses. I thought this’d be appropriate since I am donating this to Project Linus and the quilt will be going to the Loma Linda hospital. That is wonderful!! I love the brightness! Hi Rita, I love your quilt. Busy is good. Especially for kids!! What kid wouldn't like that quilt? It's adorable. I am so glad you are participating with us in this String Thing challenge. Happy Quilting. love the border...directions please. What size blocks did you use? Awesome!! What a great quilt. Love the border. Love it. I make alot of I Spy quilts ... now I can make a Spy String. Thanks. For mattsmom499: I made the border using strings left over from the blocks. I randomly sewed the strings together, maybe 4 or 5 at a time. Then I crosscut to create a strip that is 4.5 inches wide. This created a "pieced strip". I sewed these strips together until I had one strip long enough for the border. Hope this helps!